Our family has been making the Green Curry every month for many years. Kids love it too. The Thai Green Curry features chunky veggies in a lip-smacking green curry, constituted of aromatic herbs and spice powders, tangy lemon juice and rinds, and of course, onion, ginger, garlic and the usual repertoire of flavour enhancers. Like in most Thai preparations, coconut milk does the balancing act making the curry perky yet pleasant to the taste buds. The veggies in this preparation have been chosen to balance colour, flavour and texture. However, you can comfortably use other vegetables of your choice. Stir-fried vegetables in a tangy orange sauce with peanuts and sesame seeds. An authentic spicy red Thai curry simmered with assorted vegetables. An excellent accompaniment to steamed rice, Thai red curry is simply amazing! An awesome indo-Thai Shrimp Curry that's bursting with flavor yet is so simple to prepare. The Indian and Thai cuisine flavours blend so well with each other that the fish curry is a must try recipe to be relished with steamed rice. 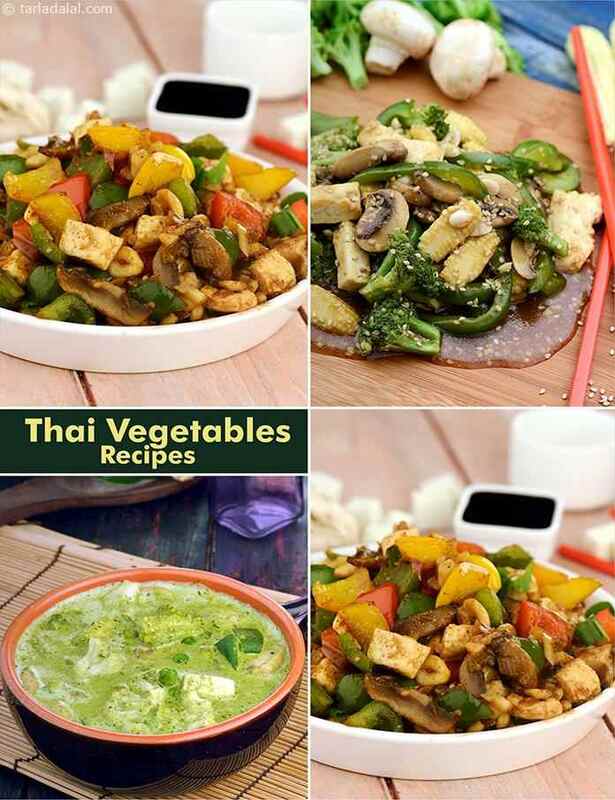 Thai Green curry presents an aromatic Thai recipe prepared from assorted vegetables, lemongrass and chosen herbs. A traditional Thai Green curry recipe which is typically enjoyed with rice . It can also be prepared with chicken or fish. Thai Style Vegetable Curry, it is dry spicy vegetable preparation. This curry goes well with plain steamed rice.